Spring rings in a steady season of design and architecture tradeshows and events including the ICFF, BKLYN Designs and WantedDesign shows in New York, the Dwell on Design fair in Los Angeles, April’s nationwide Architecture Week, and the Venice Biennale celebrating international architecture, all leading into the AIA Conference on Architecture. But it’s the Architectural Digest Design Show, held each year in New York, that marks the season’s kickoff event for designers, architects, and independent and established manufacturers. 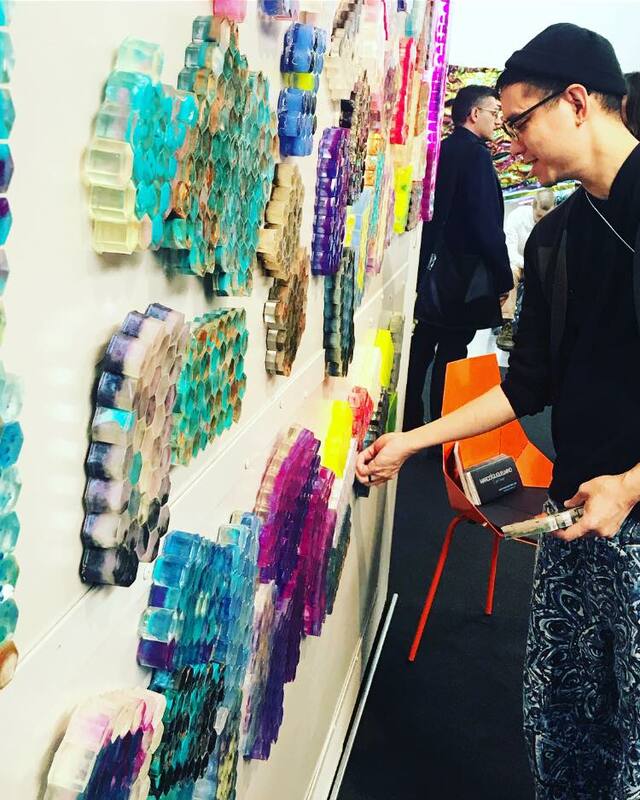 The AD Design Show draws about 40,000 design aficionados, makers and media members, armed with iPhones in hand, ready to capture and share the latest trends in furnishings, design accents, lighting, appliances and art. Here’s a roundup of inspired designs that caught our attention. 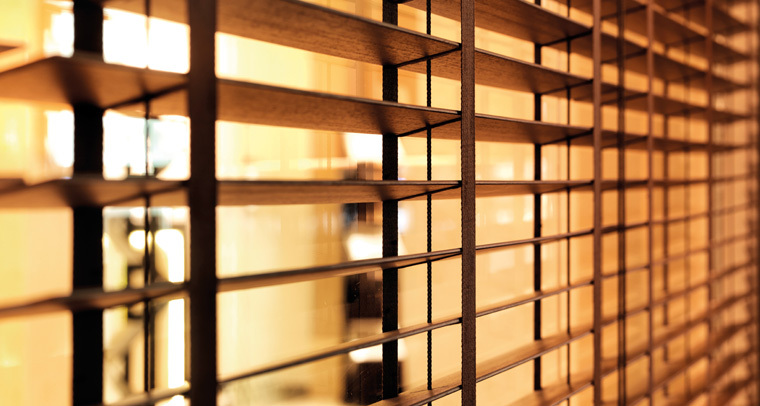 Plus, take a look at Hunter Douglas’ residential window coverings booth, which was honored with the “Most Innovative Booth Design” award this year. 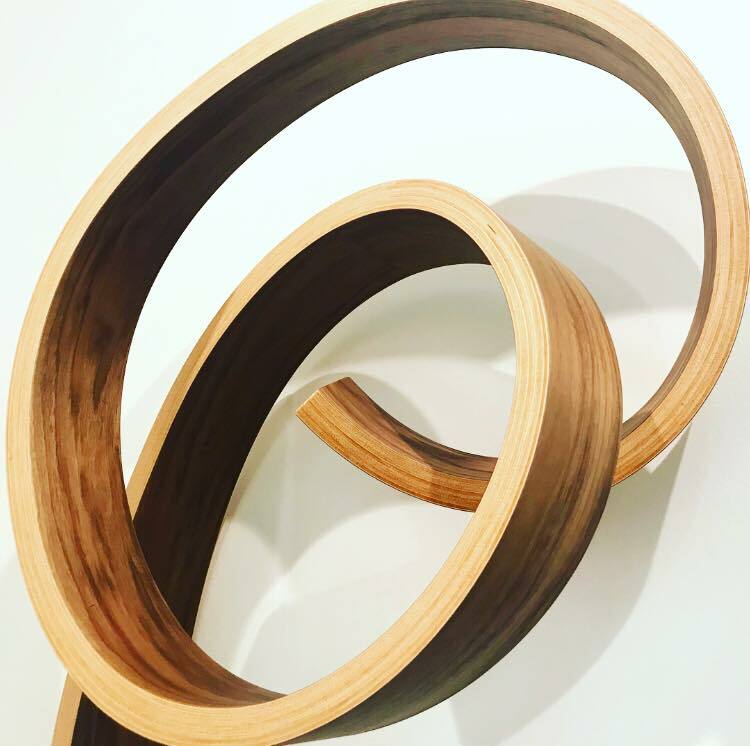 At the AD Design Show, interior wood accents with rounded edges in softer finishes emerged as a major trend. 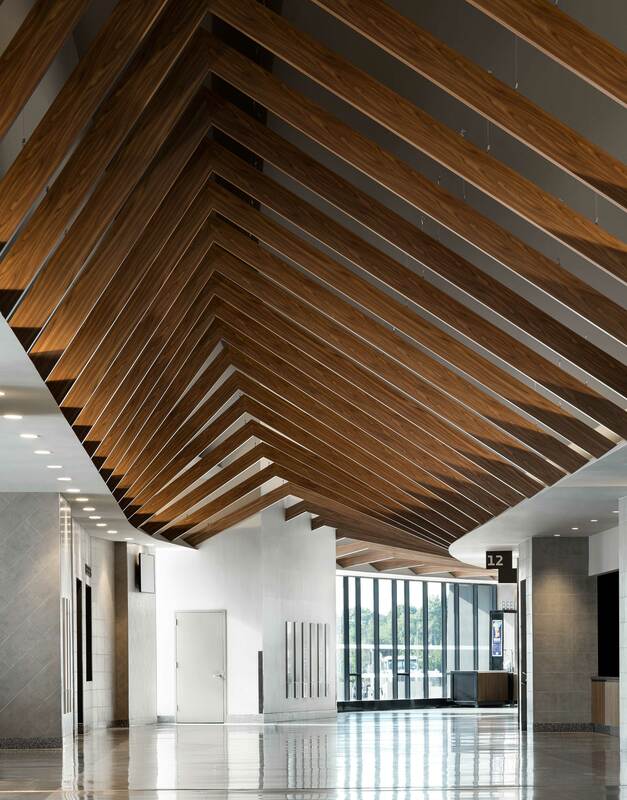 The look adds an organic feel that celebrates the simple, natural beauty of wood — and seamlessly complements a room’s wood ceilings and floors. 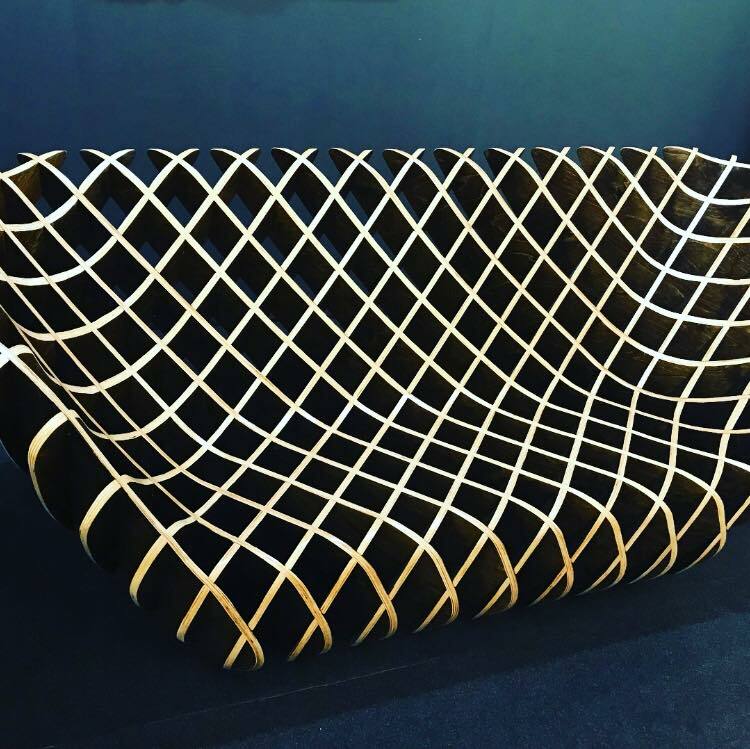 A number of designers offered lessons in curved geometry, like Bones Studio‘s sculptural wood benches, chairs and sofas that double as function art. The driving design vision behind the Raleigh-based studio is to juxtapose natural shapes with clean lines, and natural materials with modern metals. Likewise, A for Ara adds smoothed wood to high-tech audio speakers to delight ears and eyes. 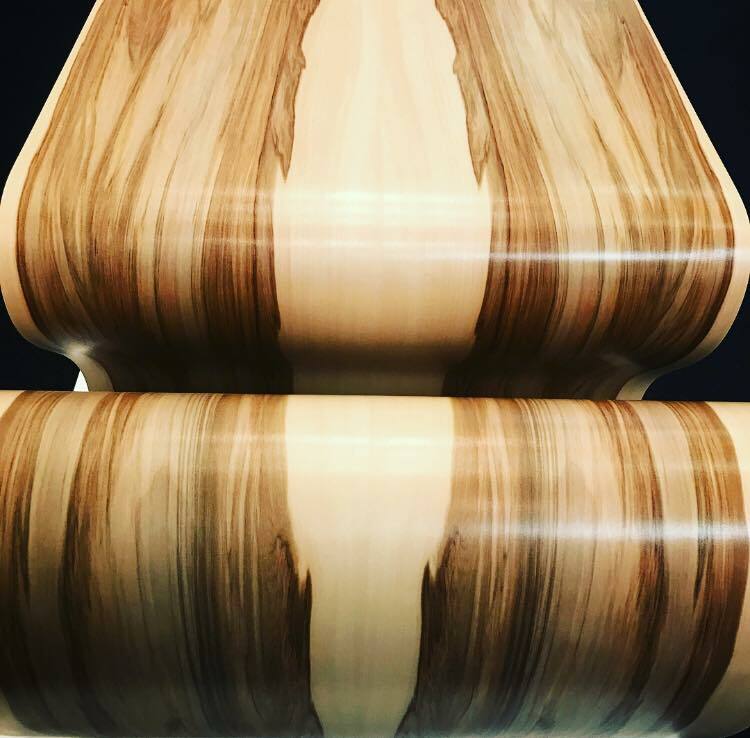 Large, solid hardwood horns help filter sound and add a unique design element to an interior. The furniture created by woodworker Kino Guérin adds a serious sense of fluidity to the “hard” material with tables, shelves and books that twist, turn, curve and curl. 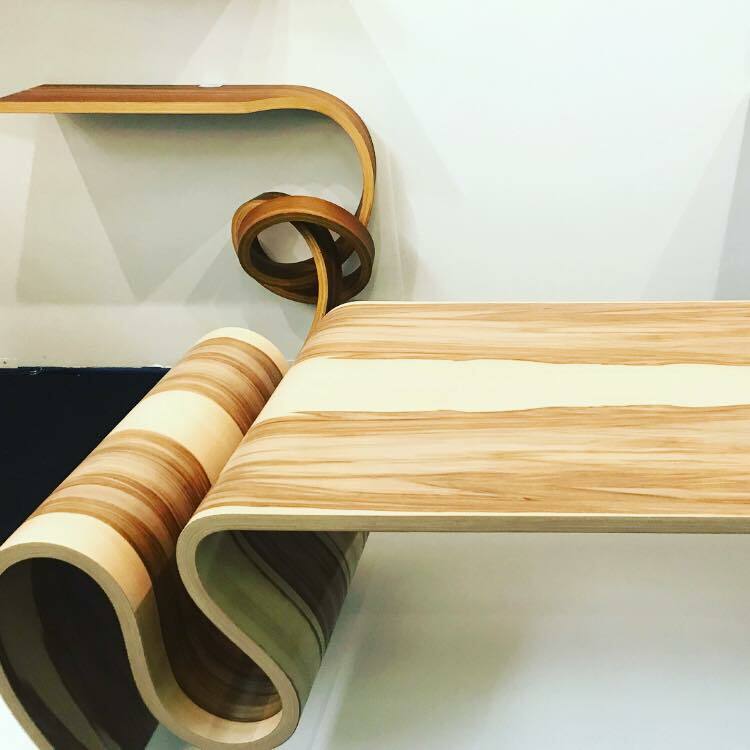 Pieces like benches made of laminated bent plywood may look like art but can withstand weight like any traditional bench, and are available in a variety of combined finishes like quilted maple and cherry or walnut burl and cedar. Ot/tra by Zimmerman Workshop offers a collection of furniture for workplace, hospitality and residential environments. 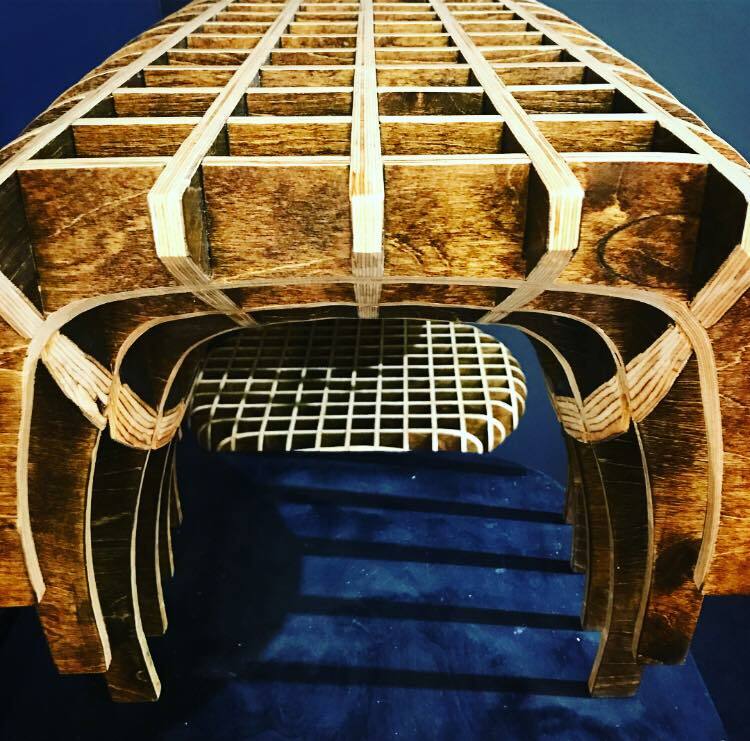 The Brooklyn-based wood shop was founded by a husband-wife team of architects, Adam and Sofia Zimmerman. 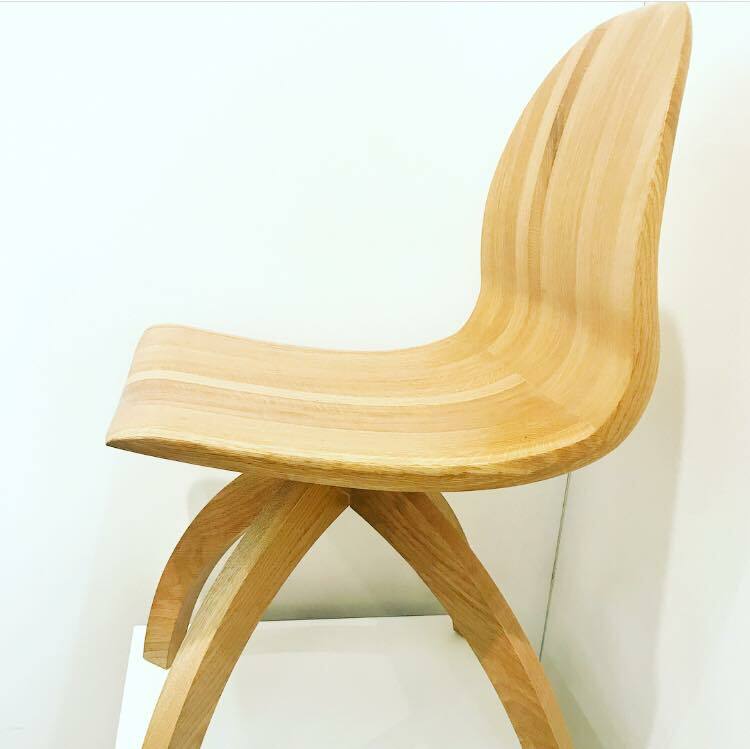 While modernism can imply a degree of sleek coolness, using local wood to create furnishings with softer curves translates into organic warmth. 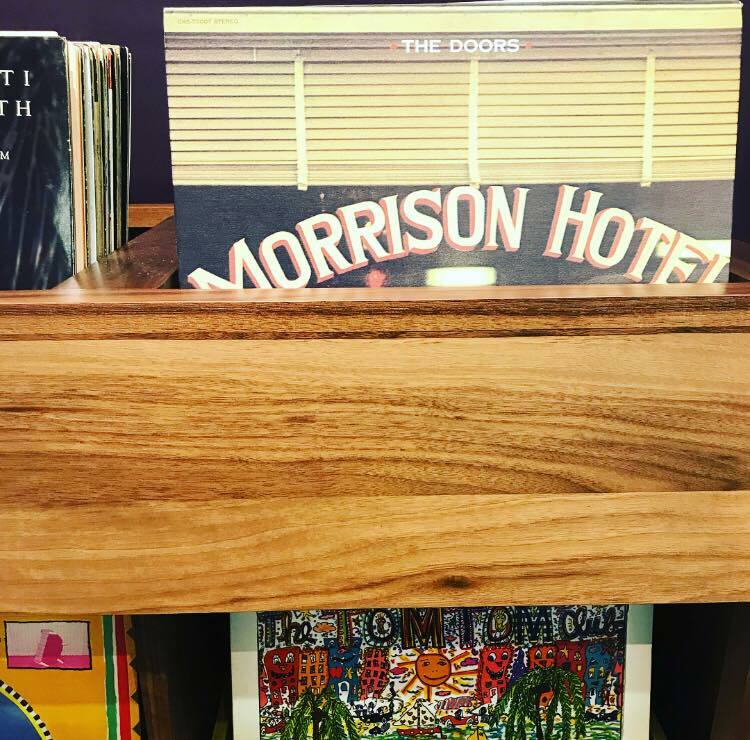 Symbol Audio, which designs sophisticated vinyl record consoles and cabinets, also fuses together wood and tech to create handsome statement pieces. 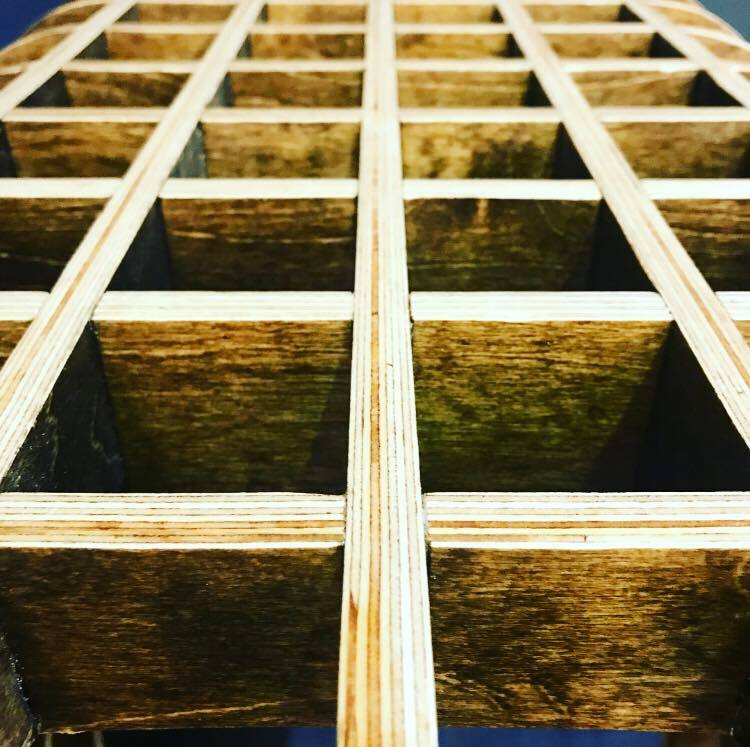 Weighty, solid walnut is fashioned into neat, modular storage solutions with leather handles to update ‘old school’ display of stacks with modern, clean edges. Check out more ideas on how to add a wood look to your windows and the fifth wall in a way that’s creative and contemporary yet warming and welcoming whether it’s with wood tiles, planks and grills, straight baffles, metal beams wrapped in a wood look finish that come together to form peaks and valleys, or diverging beams and baffles that can add a unique pattern of lines to the ceiling. 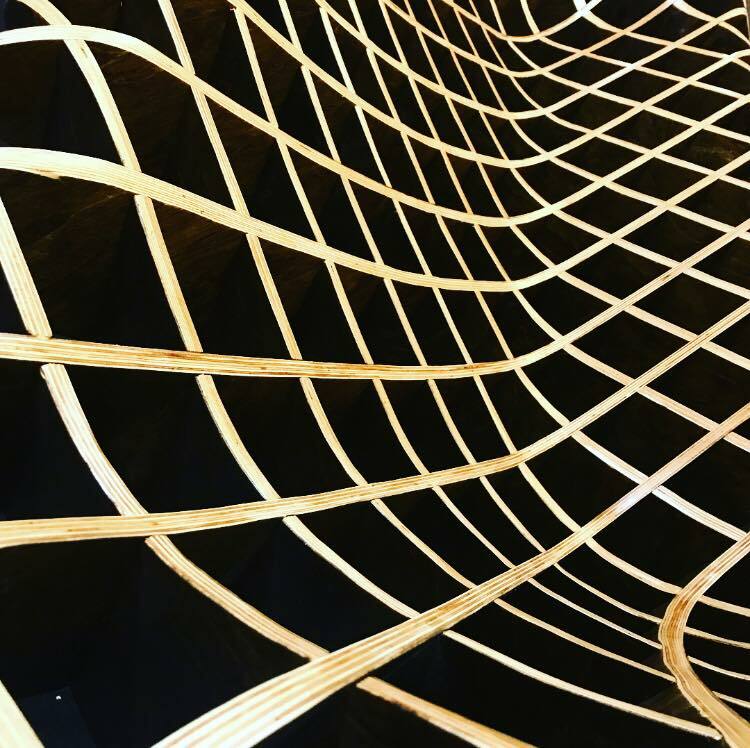 Architects and designers are acknowledging the timeless and transformative nature of wood as a material that can be reinvented and adapted to meet new design goals. 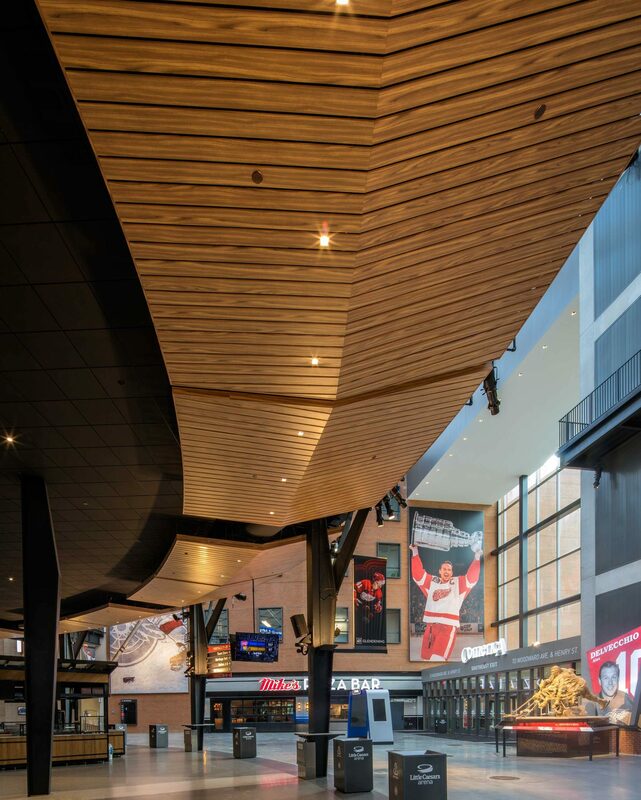 Peaked metal beams with a decorated wood look finish lead visitors through the curved concourse into the bowl. 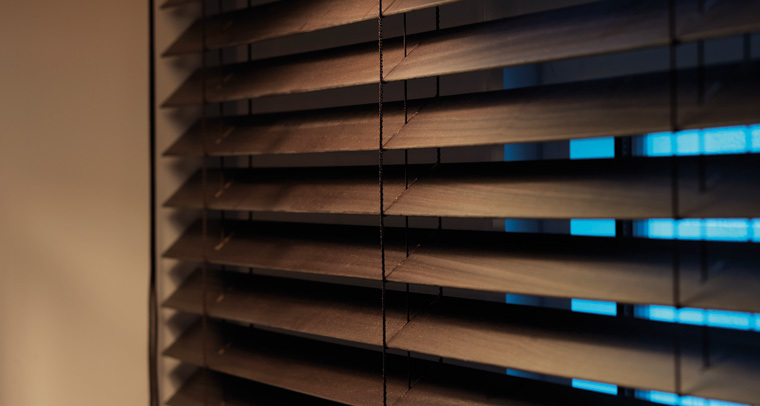 While Hunter Douglas’ residential and architectural divisions offer expertise in natural light and solar control, we also appreciate how lighting design builds upon the same principles. 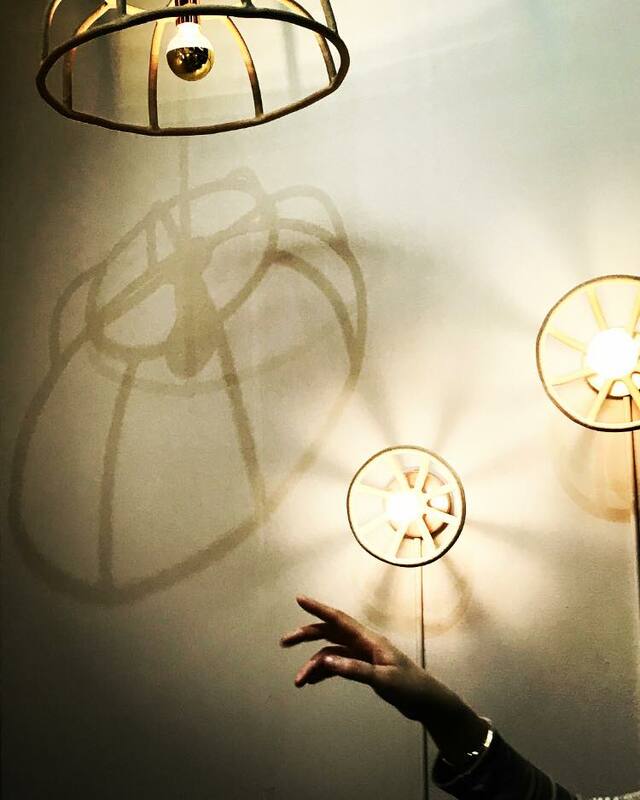 Like managing daylighting with window coverings, lighting design is the choreography of the effects of light and shadow playing off space and shape to form and filter sculptural shadows. 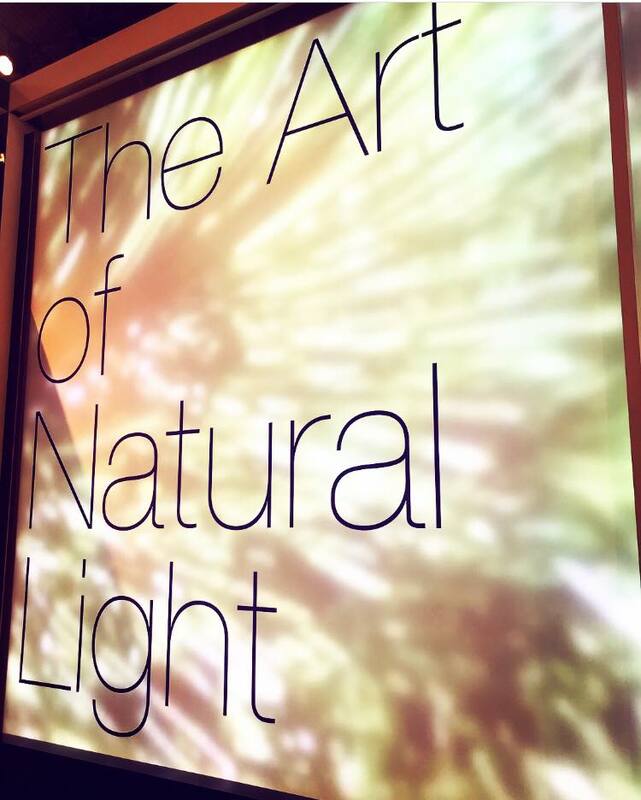 The ultimate goal is mutual: to transform the atmosphere of an environment and to captivate with the inherent natural beauty of warming light. 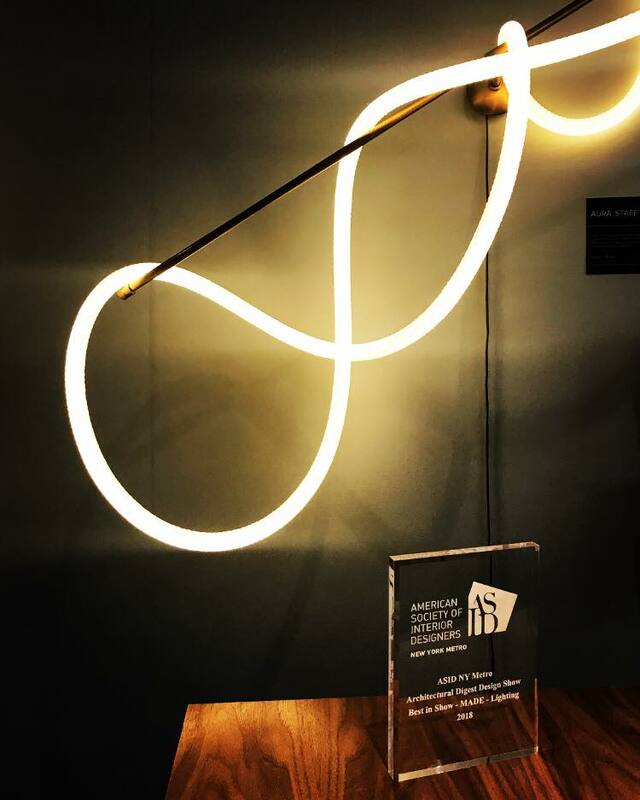 Luke Lamp Company believes lighting is a small yet critical design element within a room. 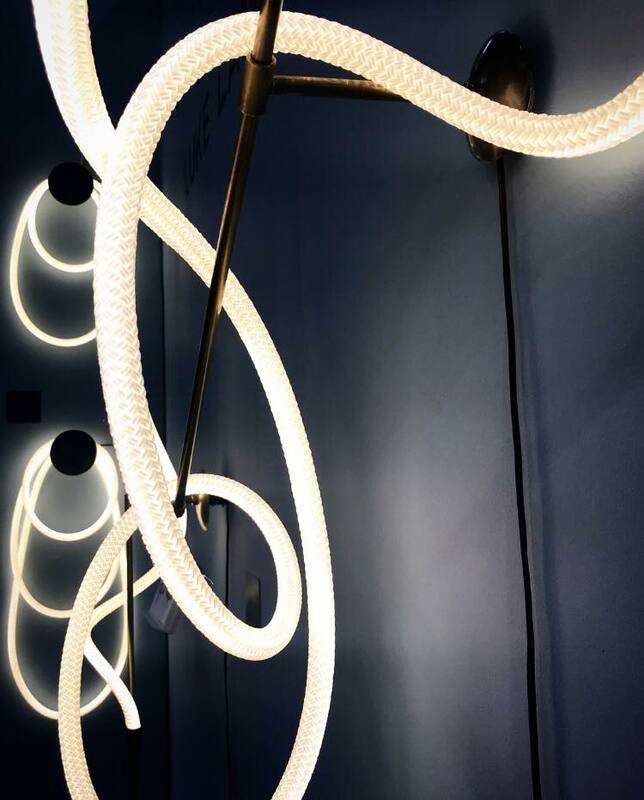 Its Aura collection features custom LED rope lighting and chandeliers that are bent to form elegant sculptures that appear to float while its Tracer collection of pendants, bars, and loops are flexible and available in range of sizes to accent a corner of your home or help light a hotel lobby. 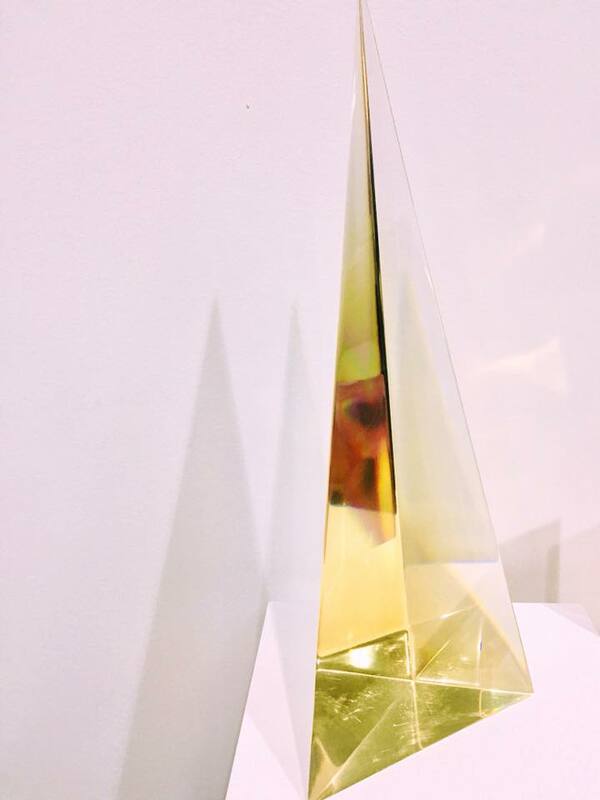 The brand took home the American Society of Interior Designers’ “Best in Show” award for lighting in the juried MADE category this year. Virginia Sin’s SIN studio, based in Brooklyn, is using terracotta in a fresh way to create pinwheel-like scones. While these are beautifully understated objects in and of themselves, the design also boasts the cool side-effect of casting shadows that pattern walls with intriguing sunburst-style circular shapes. 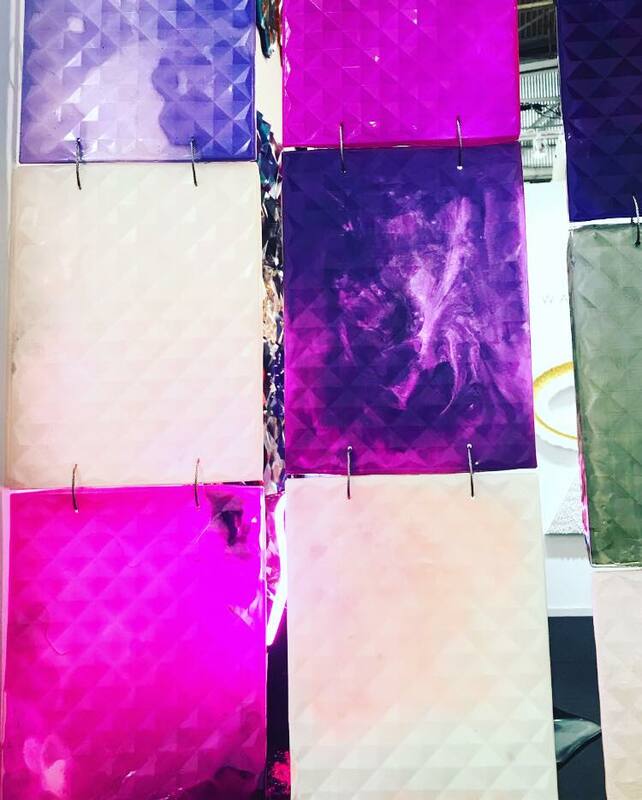 Artist and color stylist Marco Guglielmino’s booth featured walls with ultra-saturated colorful hexagon and honeycomb-shaped multi-dimensional resin tiles. 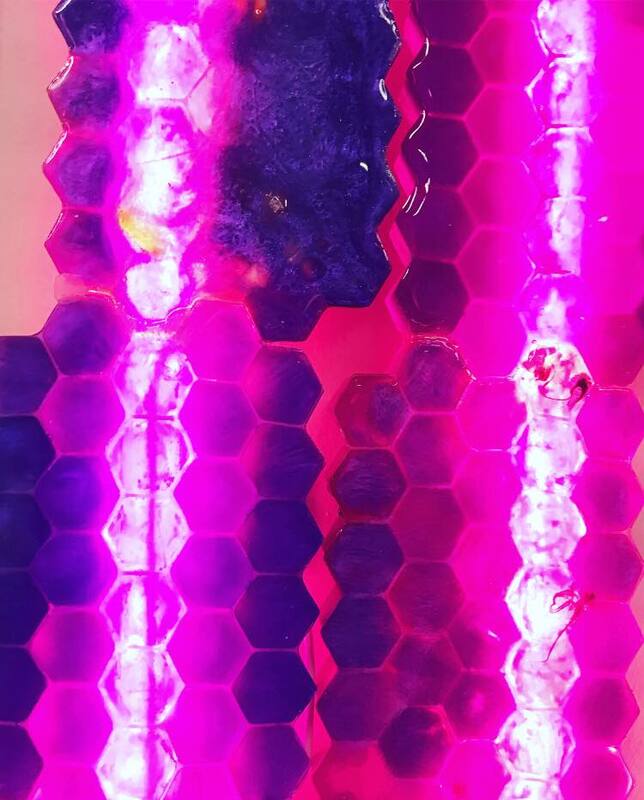 Some of these were backlit with neon strips to create incredible color stories, while in another area, “swatches” of the hanging multidimensional material revealed varying luminosities and effects brightness. 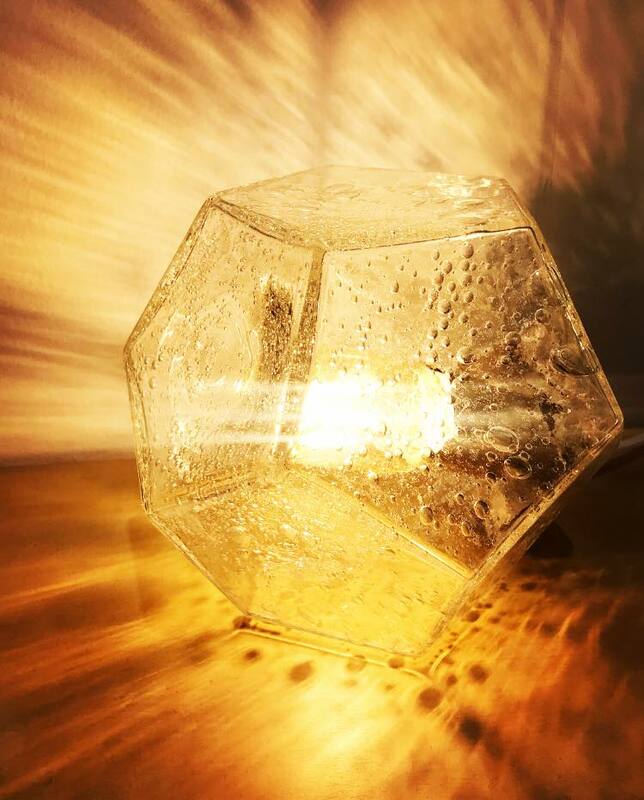 A hand-blown hexagonal glass object by William Couig featured at the Furthur Design booth illustrates how yellowed light can bounce off sharp angles to produce an intense, warming glow. Couig groups these angular objects together to form abstract chandeliers overhead too. His work has been commissioned by clients like the NoMad Hotel, Eleven Madison Park and Calvin Klein Home. Contemporary lighting design and manufacturing studio, Allied Maker, brings craftsmanship to decorative, minimalist fixtures. 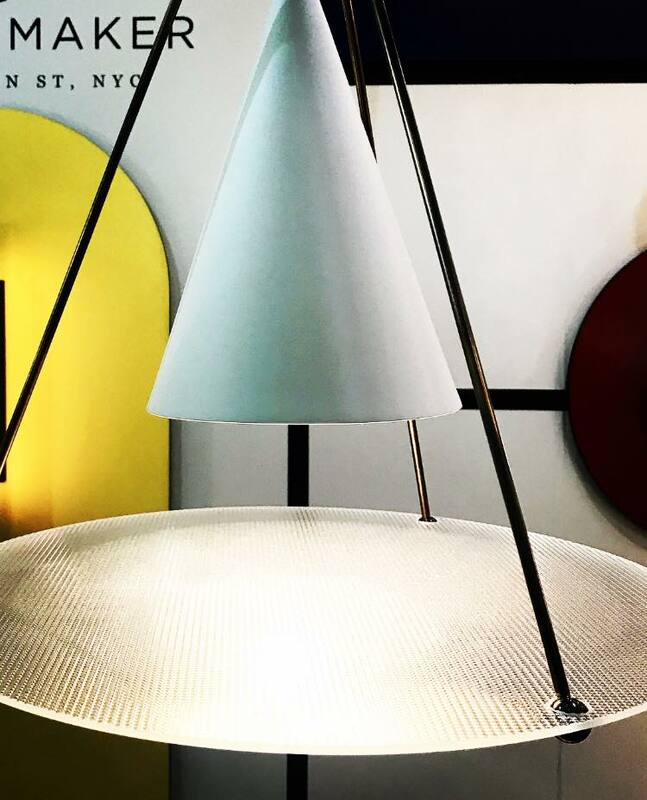 The New York-based studio similarly plays with geometry — a small, cone-shaped structure with a spotlight and a suspended glass disc with a micro-pyramid texture allows light to diffuse with a striking flair. 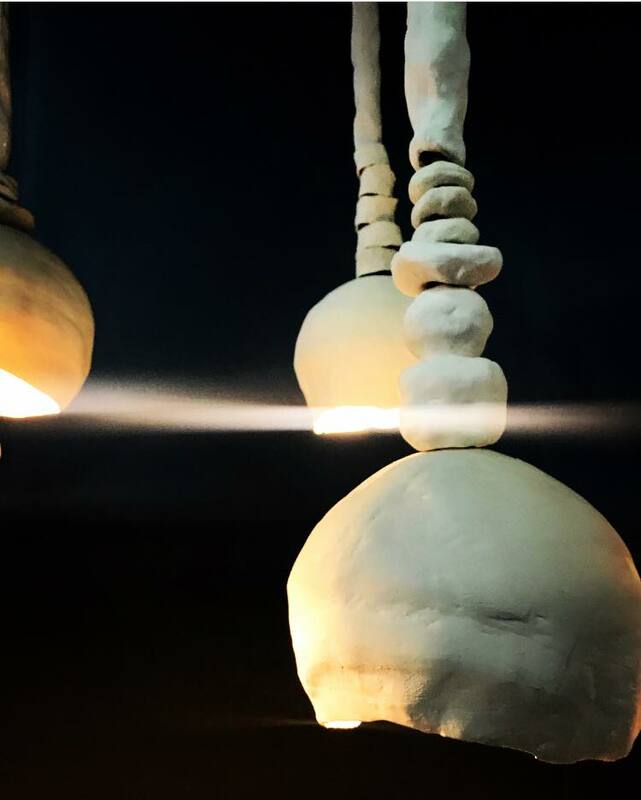 Crosland Emmons brings an added sense of the human touch to lighting design with hanging globes, orbs and stacked rings of raw, natural white rounded shapes made of porcelain and earthenware, supported with brass poles. You can customize the globes’ scale, height and polish to make a statement that celebrates natural materiality and illumination. 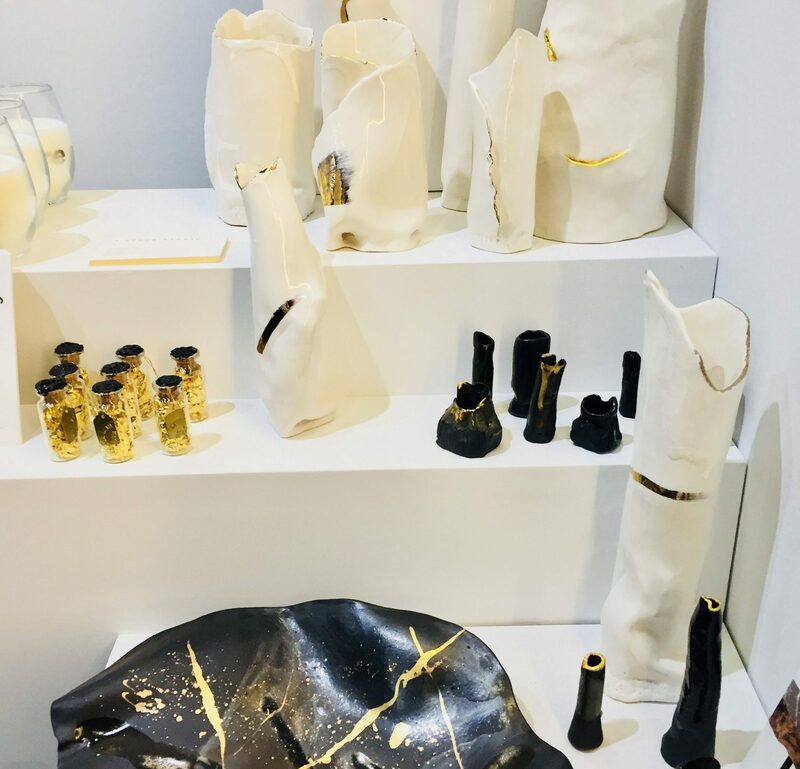 Decorative objects and the talented makers behind them, stole the show, especially in the MADE section, which features a grouping of boundary-pushing galleries, artists and designers picked by a jury. 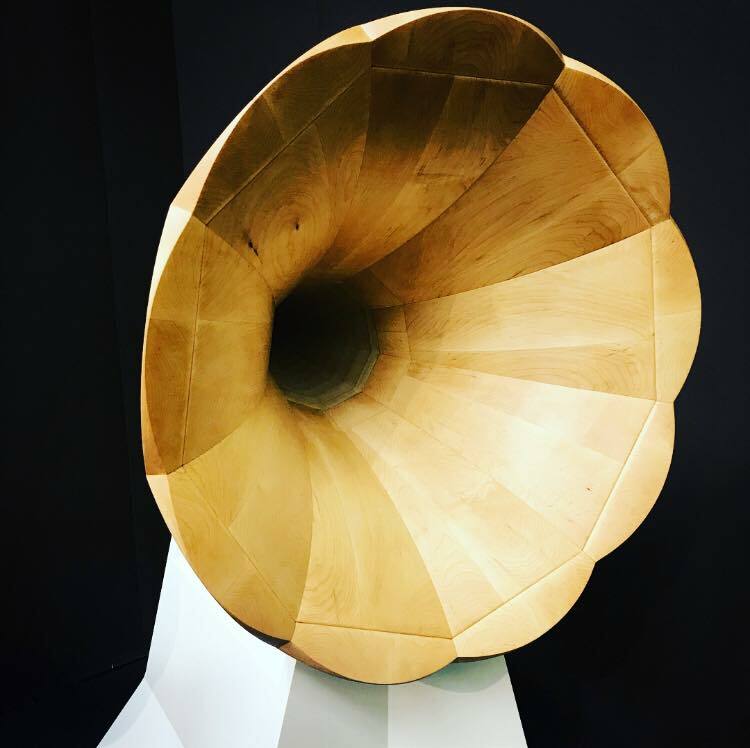 Designers made loud statements with artful objects, both big and small. 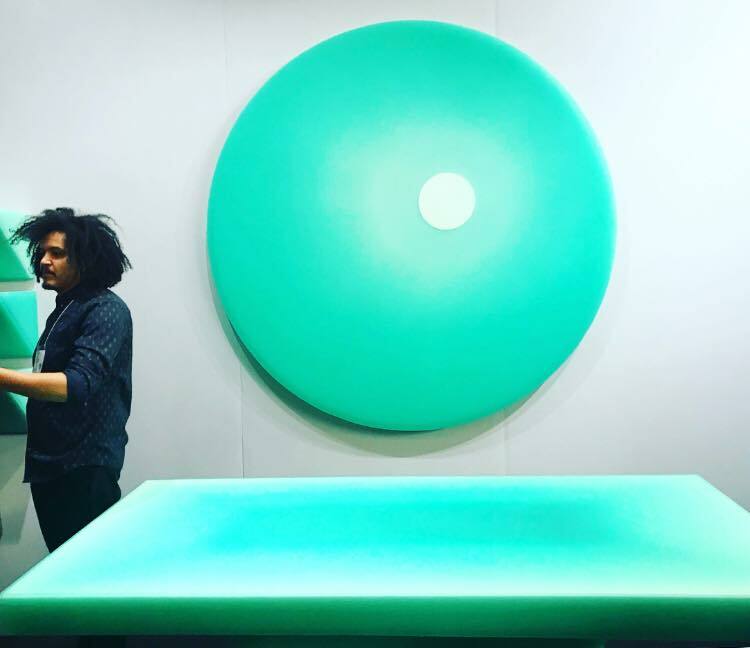 The buzzworthy Facture Studio, out of Brooklyn, displayed contemporary green epoxy resin “art furniture,” which drew in the crowds during the show. 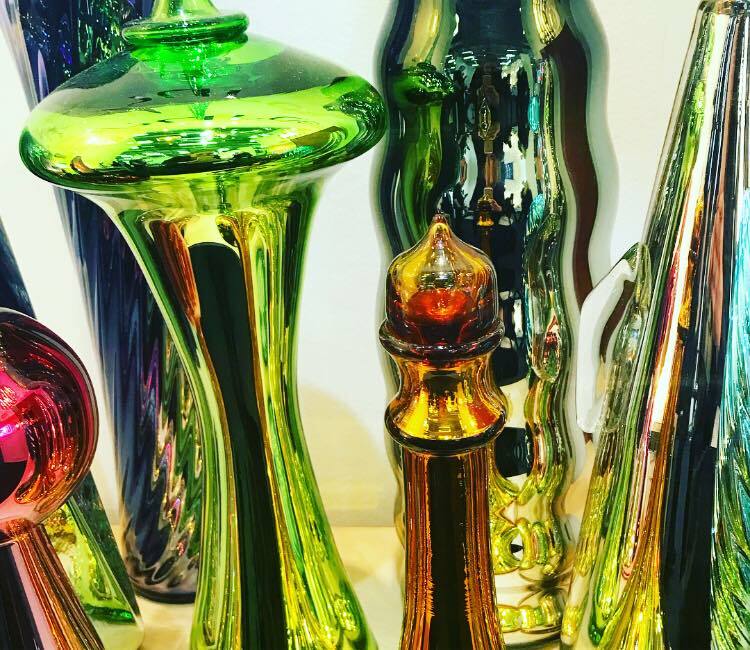 While the pieces are bold, upon closer inspection, the designers’ attention to detail shines through with deliberate, subtle changes in coloration depending on the opacity and depth of resin cast. Similarly, zooming in on the details of Umé Studio’s curtains reveals a soft, organic approach applied to a standard household item. 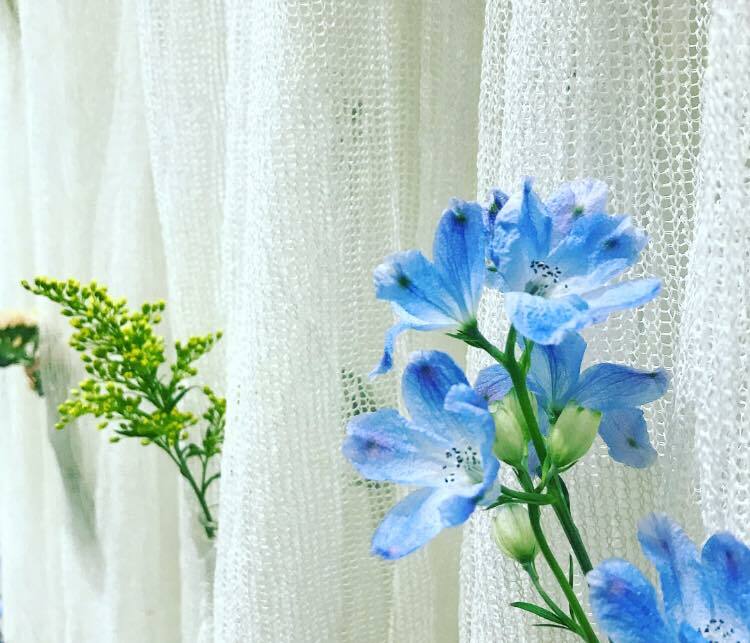 Real flowers are tucked into slight pockets on hanging, washable fabric which uses thread made from paper. If you take a step back though, the drapes appear to be patterned in a 3-D way. 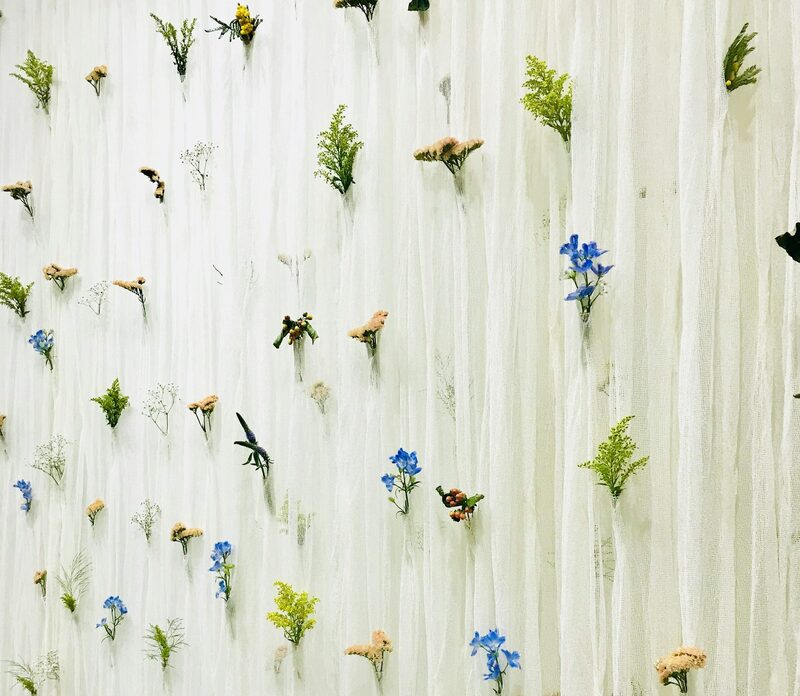 This acts as both large-scale art and an ever-changing divider where 100 fresh flowers can be swapped out, bringing a nod to each season into an interior space. The pieces were created by Scandinavian textile designer Akane Moriyama, whose background in architecture helps inform the concept of inviting nature into built environments. The customer ultimately assumes control over the aesthetic through the DIY approach of customizing the floral tableau (and accompanying scents) that are experienced. The visual effect of Korean-born Veronica Juyoun Byun’s colorful tiled wall art also alternates as viewers stand back or step in. 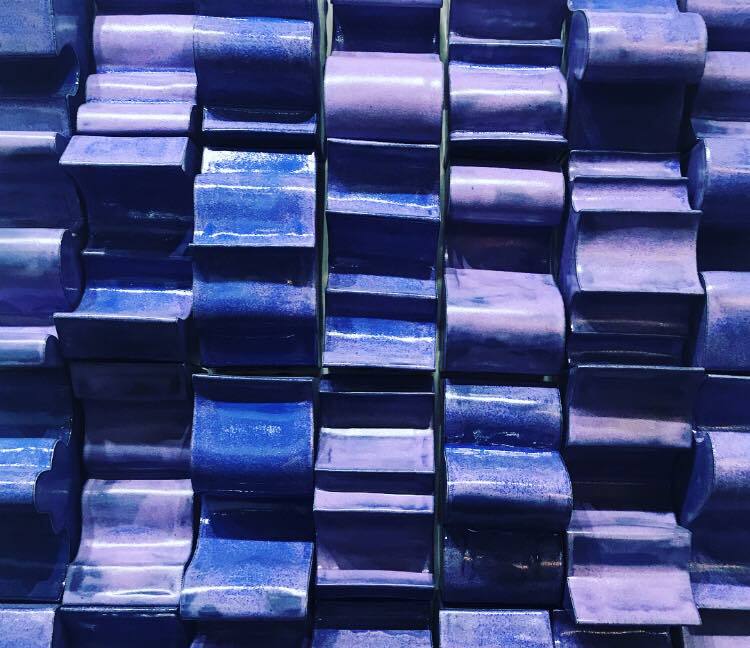 Byun plays with layers of clay that can be expanded into virtually unlimited formations to become part of an architectural space, while introducing rich colors in polished finishes. LA-based artist J.S. Nero is exploring the alchemic properties of resin with her seductively beautiful, geometry-inspired sculptures. 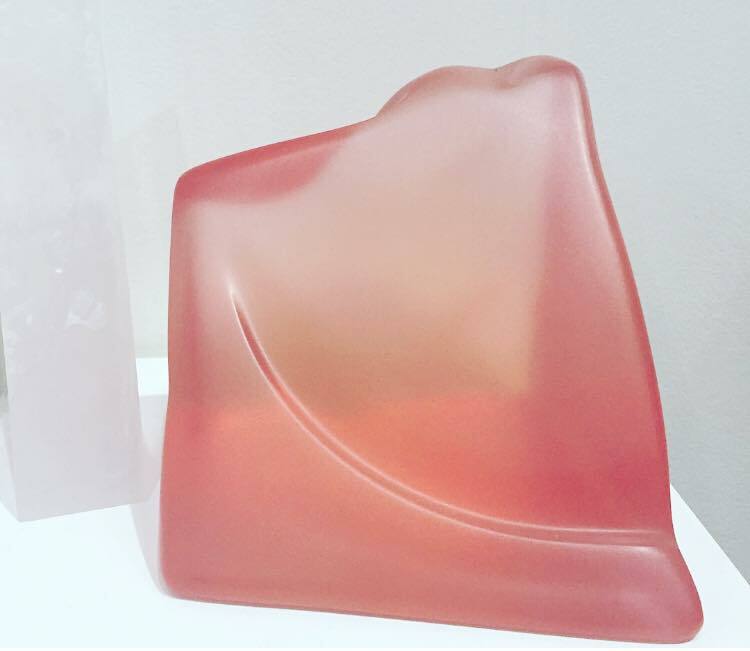 She tints and sculpts polyester resin and art plastic into emotive prisms, lines, and abstract shapes like her smartly folded WiVes table or pink “Bag” impression. 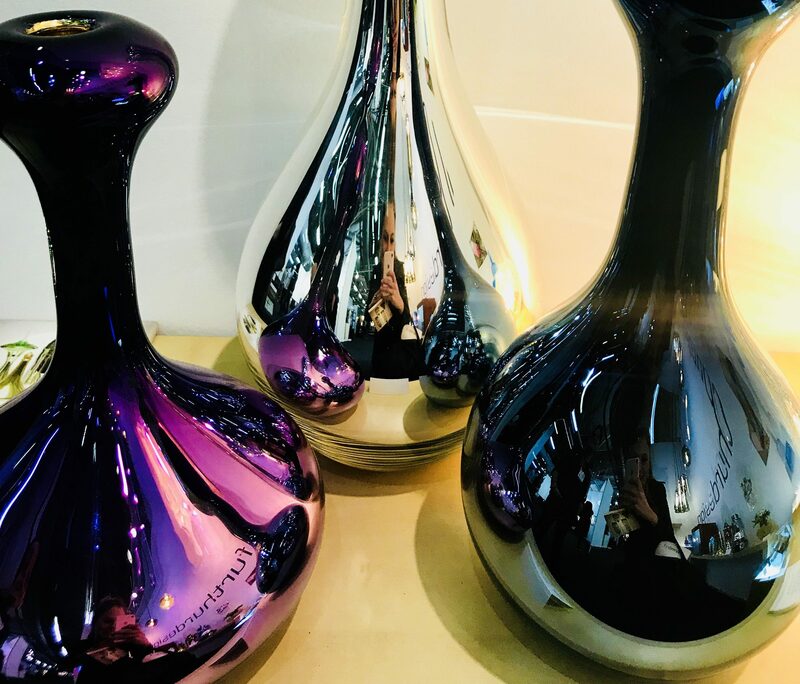 When Nero’s thoughtful design objects, which vary in pigmentation and finish from high gloss to matte, are lit, they take on a new magic aura. Detroit-based design studio Aratani Fay is turning everyday objects into contemporary art. 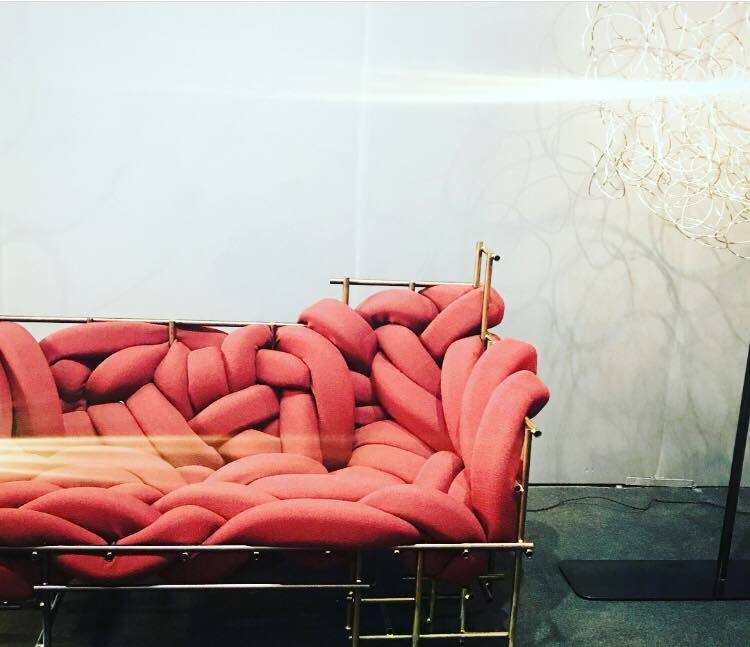 The designers are reinventing traditional seating with expressive couches and chairs formed with thick, colorful interwoven upholstered padded “ribbons” that are twisted into sculptural constructs. The design team strikes a balance between whimsy and comfort. In recent years, British visual artist Shantell Martin has practiced and perfected her black-and-white drawings through large-scale installations, live sketch events, and commerical collaborations with the likes of Puma and the musician Kendrick Lamar, so much so that her lines are now recognizable for her signature style. 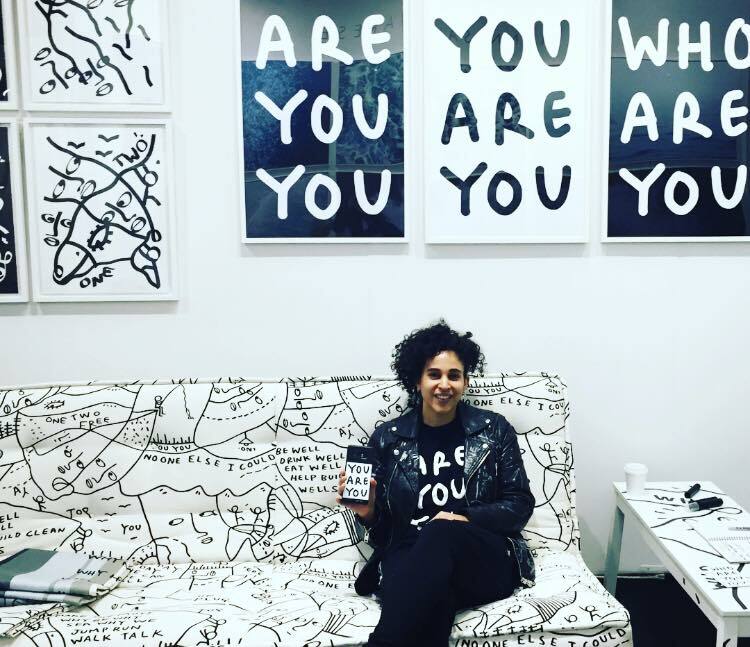 Martin, who now works out of a New Jersey studio, was showcasing her “You Are You” messages and drawings, which jumped from the wall behind her, to the couch she sat on, to the kicks on her feet, creating an expressive black-and-white world aimed to inspire originality. 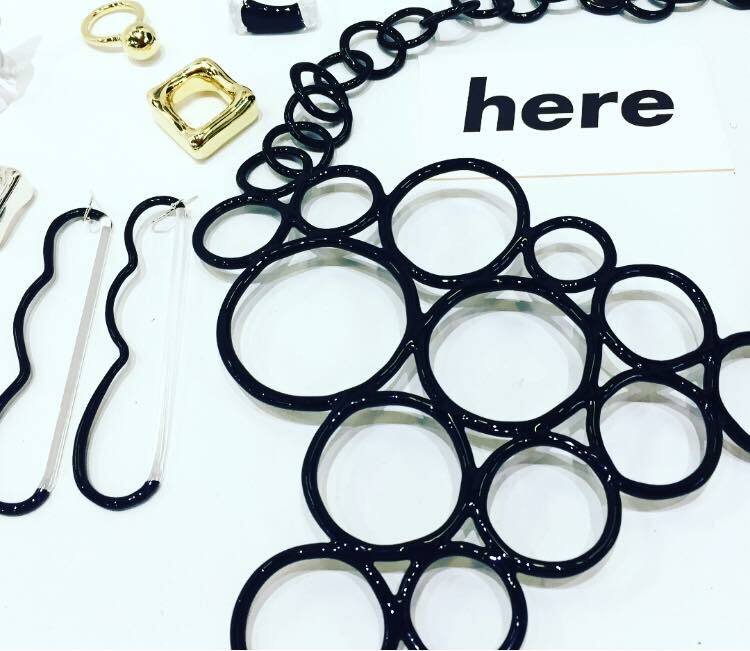 Here Projects, a collective of collaborators who present artful designs and create pathways towards empowerment, charmed visitors. The group’s booth was filled with diverse eye candy, including J.S. 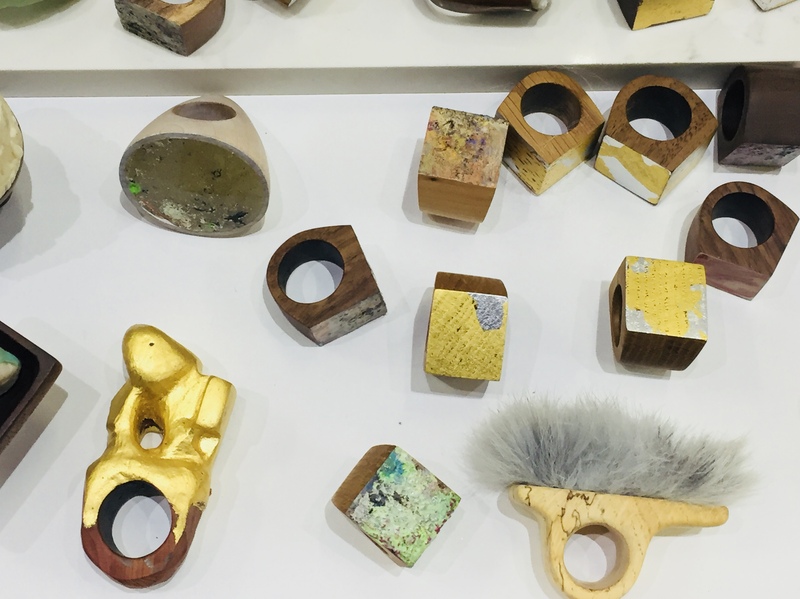 Nero’s sculptures, Jane D’Arensbourg’s fun glass rings and wearable Pyrex jewelry art that plays with scale, and necklaces of gilded animal skulls and other objects of nature by Harlem’s Goldlab.NYC. 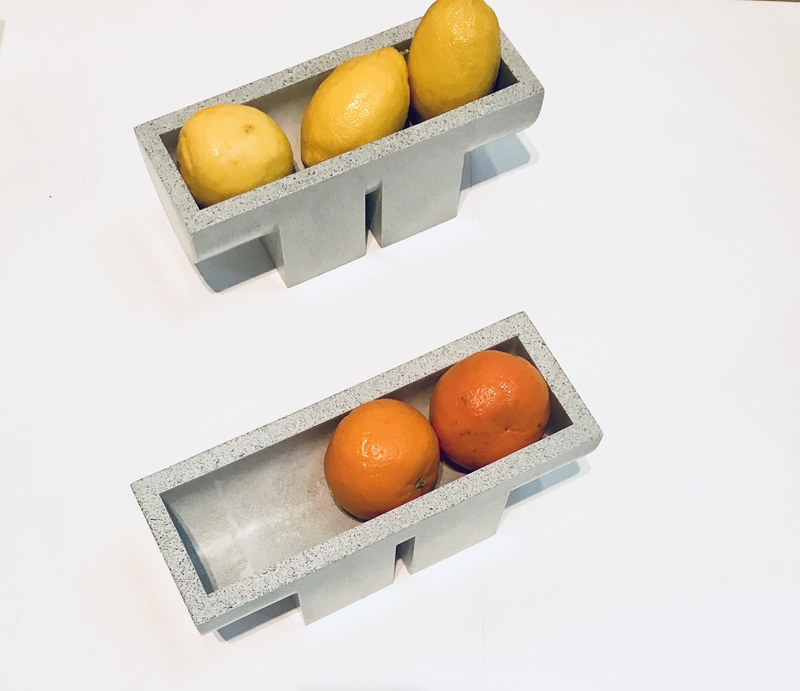 New Format Studio’s angular vessels, which are made of silicon bronze and white resin that’s patterned from large foam blocks, look like decorative, shiny jewelry for plants. 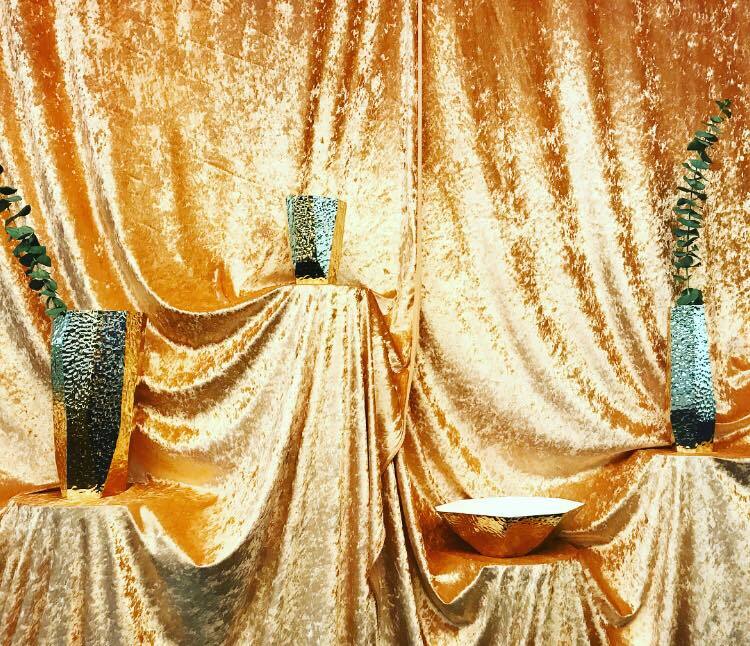 The Vancouver-based studio’s display ornately celebrated the art of the object, placing the texturized metallic vessels against a draped, rich velvet background. After a foam block is used to create a floral “vase,” it is completely destroyed so that each vessel is entirely unique. Glass is transformed by Furthur Design into fabulous, shiny metallic-coated vessels in the “Skyscraper Series.” The shapely pieces instantly draw in attention, as Millennium Park’s Cloud Gate shiny, bean-shaped sculpture attracts Chicago’s visitors seeking the perfect photo opp. 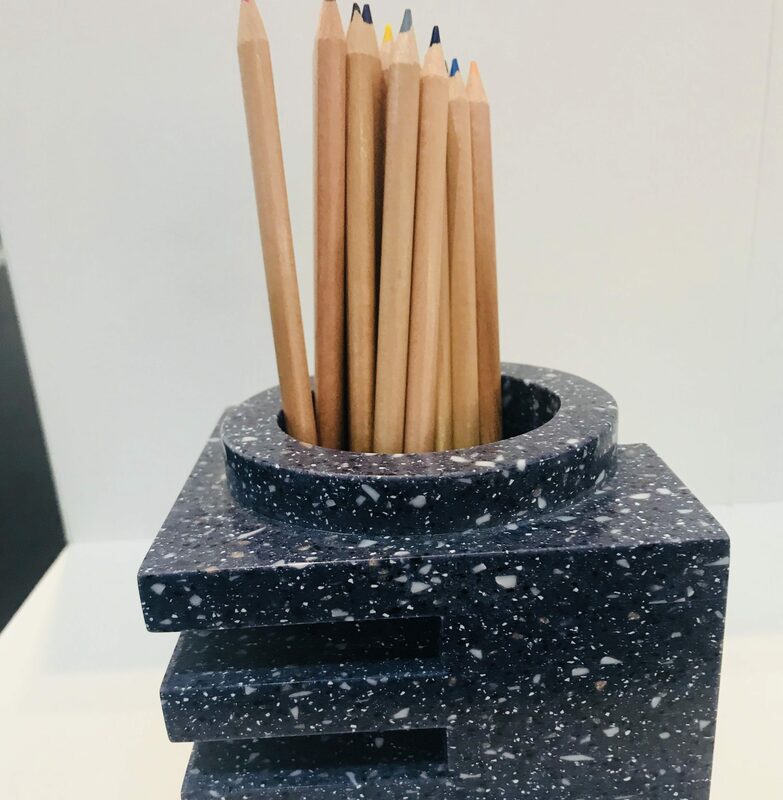 At Spadone Home’s booth, functional objects like speckled Art Deco-inspired vessels and chic, Brutalist-style grooved pencil holders and planters, honor an artistic mission to make something more of the ordinary. Each object is handcrafted by Miles and Molly, two siblings from Kennebunk, Maine who collectively have backgrounds in ceramics, mold making and furniture design, a skillset they inherited from each of their parents. 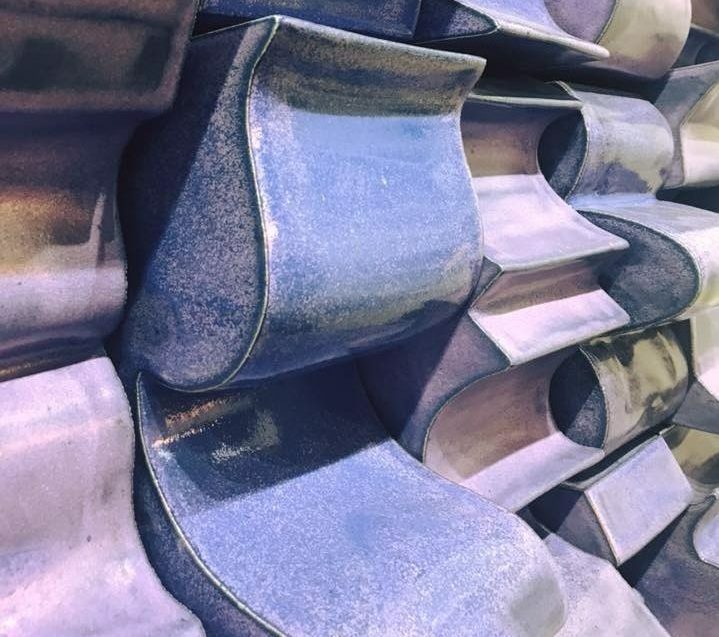 The Architectural Digest Design Show made design aficionados zoom in and step back for different perspective, appreciate the craftsmanship behind the object, smile at reinterpreted materials transformed into new forms, and rethink the marriage of function and style. 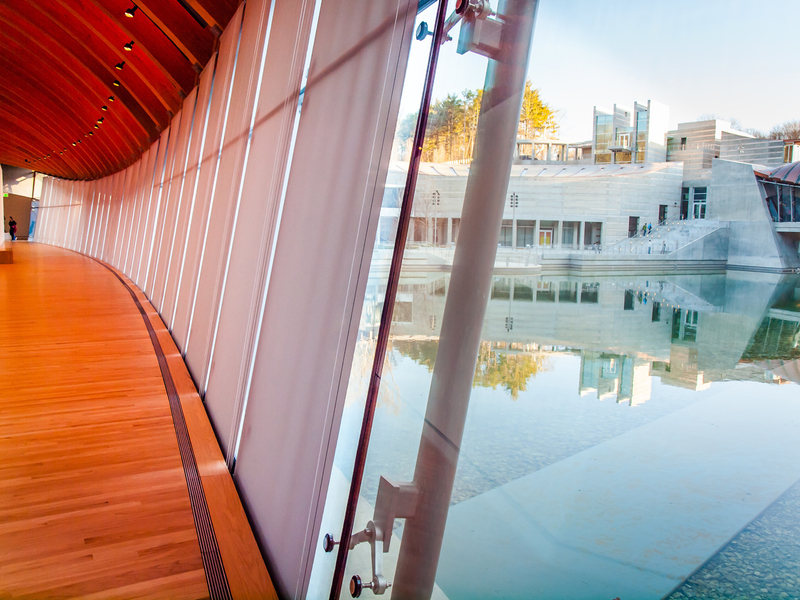 And hopefully, the well-received show also left the crowd feeling eager to check out the rest of this spring’s upcoming design and architecture events.